Are certain cancer treatments actually making things worse? 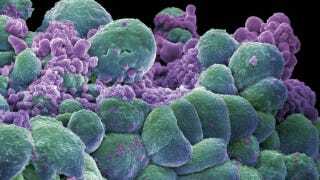 A study published today in the journal Cancer Cell has put forward something terrifying — that one of our current way of fighting tumors might make them more deadly. The researchers examined anti-angiogenic therapies, or those treatments which cut off blood supplies to tumors, thus making them shrink in size. The scientists analyzed ways of cutting back the pericytes in tumors, or cells which help blood vessels grow. In pericyte-depleted mice, tumor volumes shrunk significantly, but surprisingly there was a threefold increase in the formation of secondary tumors. By cutting back on their size, the tumors metastasized far more readily. "If you just looked at tumor growth, the results were good," said senior author Dr. Raghu Kalluri. "But when you looked at the whole picture, inhibiting tumor vessels was not controlling cancer progression. The cancer was, in fact, spreading." "This suggested that smaller tumors are shedding more cancer cells into the blood and causing more metastasis. We showed that a big tumor with good pericyte coverage is less metastatic than a smaller tumor of the same type with less pericyte coverage." Unfortunately, it gets scarier. Some cancer drugs like Imatinib and Sunitinib have been shown to reduce pericyte levels in tumors, too — and wouldn't you know, in the mice models, there was an accompanying threefold metastasis increase. It looks like at least some of this research may apply to humans too. The scientists analyzed 130 breast cancer tumor samples of varying cancer stages and tumor sizes, and found that low numbers of pericytes correlated to deeply invasive cancers that heavily metastasize and had low survival rates. As bleak as that may sound, it actually provides us with some incredibly useful information. For one, the spread is also associated with a boost in activation of Met, a receptor molecule associated with cell migration and growth. The researchers discovered that using Met-inhibiting drugs helped prevent the cancer from spreading. This also means that tumors have inside them some cells which are protective, and work as a limiting system to stop the cancer from spreading too far — which means its entirely possible that future cancer treatments could promote these specific regions, and lead to a more successful way of combating tumors. Via Cancer Cell. Top photo of breast cancer cells via Crafty Dame.